Did Shaikh Muhammad bin Abdul-Wahhāb rebel? The First Saudi State. 3rd December 2013 Abu Khadeejah Abdul-Wahid Extremism & Terrorism, Manhaj, Sects and Sectarianism, Tawheed Comments Off on Did Shaikh Muhammad bin Abdul-Wahhāb rebel? The First Saudi State. Did Shaikh Muhammad bin ʿAbdul-Wahhāb rebel? The First Saudi State. There are few scholars in Islamic history that have been more maligned and misrepresented than Shaikh al-Islām Muhammad bin ʿAbdul-Wahhāb , born 1115H (1703CE) and died 1206H (1792CE). The Sūfīs and Shiʿites, those who ascribe divinity and superstitious powers to the inhabitants of graves, despise him due to his condemnation of their un-Islamic and counter-orthodox beliefs which contradict the Qurānic commands that demand that worship be directed solely to Allāh and supplications of need, aid, refuge, and rescue be directed to Him alone. On the other side there are the radical Khārijite sects, some of whom regard him to be a cementer of the ‘throne’ of Imām Muhammad bin Saud , the founder and first leader of the Saudi state, and therefore a supporter of tyranny. 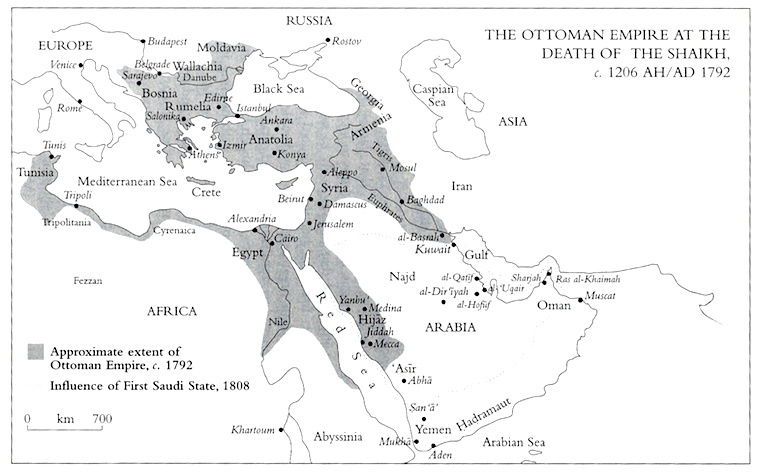 They seem to have a schizophrenic relationship with him; some have used him as an example that allows them to rebel against the ruling authority, because they believe that he sanctioned rebellion against the ruling Ottoman Empire; yet others have attacked him on the basis, as they claim, that he rebelled against the Ottomans and therefore aided in the downfall of the Caliphate. “And I do not testify for anyone from the Muslims that they are in Paradise or in Hell except for those whom Allāh’s Messenger has testified. However I hope for the righteous and fear for the sinner. In contrast to this well-known Salafī position, the leading figureheads of modern-day extremists, such as Sayyid Qutb and Taqī ud-Din an-Nabahānī, reject what amounts to one of the great foundations of the Islamic creed, which is to hear and obey those in authority in whatever is considered good in the Sharīʿah and not to oppose them or exit from their obedience on account of tyranny or injustice . Qutb and Nabahānī declared the entire Muslim world to be Dār al-Kufr (a Domain of Disbelief) and called for an all-inclusive revolution against it. Not a single Salafī scholar in modern history shares this view with them, rather they consider it to be the view of the heretical Khārijites who ought to be refuted and fought against. * Map: The Birth of the Islamic Reform Movement in Saudi Arabia, Muhammad b. ʿAbd al-Wahhāb, Rentz, George. S.
1 Talal Rajab, Re-Programming British Muslims—A Study of the Islam Channel, p. 11, Quilliam Foundation, March 2010. 2 In a letter written to people of the village of Qasīm, Najd, Saudi Arabia entitled Risālah ilā Ahlil-Qasīm (A Letter to the People of Qasīm). They had asked him to clarify some of the rumours being spread about him, so he wrote this tract in response to them. This letter is found in the sixteen-volume work, ad-Durar as-Saniyyah fīl-Ajwibah an-Najdiyyah, vol. 1, pp. 29-35. It has also been published with the explanation of Shaikh al-Fawzān with the title, Sharh ʿAqīdah al-Imām al-Mujaddid Muhammad bin ʿAbdul-Wahhāb, Maktabah Dār al-Minhāj, Riyadh. Now also available in English, Sunnah Publications, Michigan, USA. 3 Sharh ʿAqīdah al-Imām al-Mujaddid Muhammad bin ʿAbdul-Wahhāb, pp.142-156. 4 Sharh ʿAqīdah al-Imām al-Mujaddid Muhammad bin ʿAbdul-Wahhāb, p. 127. 5 Reported by Ahmad in al-Musnad from the hadīth of ʿAlī , 1/131, no. 1095; from the hadīth of Ibn Masʿūd , 1/409, no. 3889; from ʿImrān bin Husayn , 5/66, no. 20653; Muslim, no. 1840. 6 Sharh ʿAqīdah al-Imām al-Mujaddid Muhammad bin ʿAbdul-Wahhāb, p. 128. 7 Refer to their statements that have been documented in other chapters.